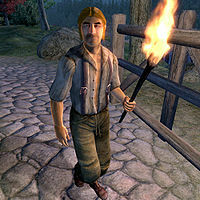 Brielus Gawey is an Imperial commoner working at the Chestnut Handy Stables located just outside the main gate to the Imperial City. Brielus takes care of the horses during the night, when all the other inhabitants of the stables are asleep. He can be found wandering around inside the corral, with his lit torch in hand, every night between midnight and 8am. After a long night amidst the few remaining horses, he treats himself to a breakfast inside the stables and then heads to bed at 10am. He gets out of bed again at 6pm and eats a two-hour dinner on the front porch outside the stables. From 8pm to midnight he will tidy up the stables with his rake. If you wander inside the corral he will follow you to check you don't steal any of the horses. When martial law is imposed during Light the Dragonfires he will remain indoors at all times. He wears lower-class attire consisting of a shirt with suspenders, sack cloth pants and a pair of rough leather shoes. He also carries a rake, some food, his torch and a few pieces of gold. In combat, he wields a rusty iron war axe. When you meet him for the first time, he will introduce himself and hint at the problems it causes when you have an Orc running the stables: "I'm Brielus Gawey. And no, we don't sell horses. But we do eat well. The stables are owned by an Orc. And you know... Orcs and horses." And when asked about the Imperial City, it becomes apparent that Snak gra-Bura might have caused the problems at the Chestnut Stables: "Sure. Some folks here think horses are for riding. Then again, some of us are Orcs. Snak gra-Bura, she prefers eating stew to riding horses." When you spend some time close to the barn of the Chestnut Handy Stables, Brielus will start following you. At that point, if you fast travel, he will travel along with you. Once arrived, he will simply walk all the way back to the Imperial City. His co-worker Restita Statlilia has a similar bug.